Retro Spouted Amber Glass Chianti Bottle w Ice Chamber. Stunning hand blown glass has cork in spout and top opening. It has large a chiller / ice reservoir / ice chamber.! Eye catching shape and color add to any bar, kitchen, outdoor area, or vintage glass collection. This are beautiful with candles. Turn it into a drip candle. Create the old world Italian Restaurant look by using different colored candles and letting the wax build, creating a large decorative Drip Wax Candle holder. My kids love making drip wax candles, it is very relaxing and fun to use at dinner time. Perfect Vintage Glass for home decor, candling, or actually decanting of wine. 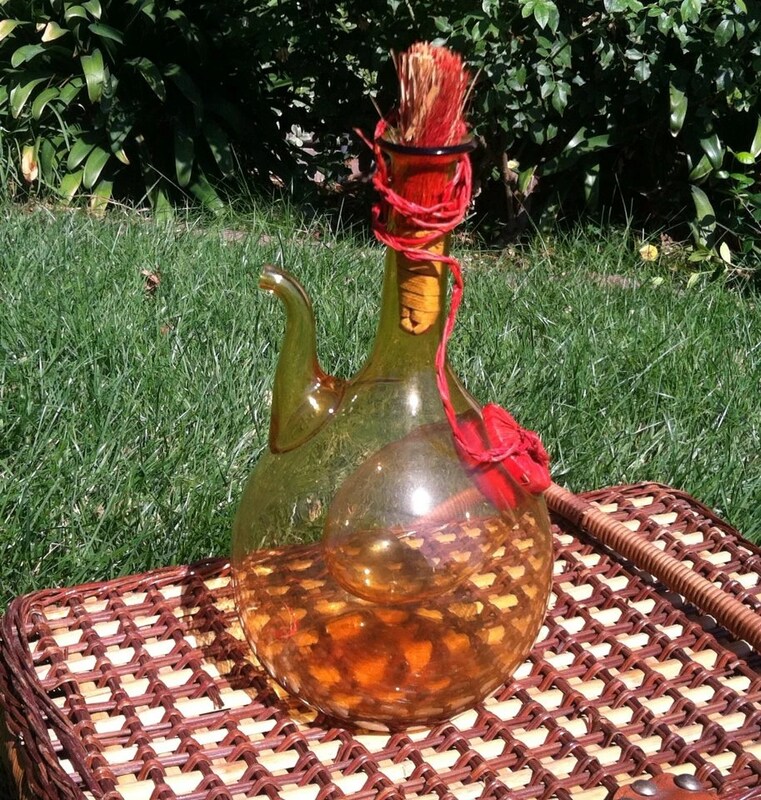 My husband make sun tea in a three gallon jar, an old wine decanter is a fun water to chill the tea on an afternoon. Just funnel tea into jug and place ice in reservoir and your have nicely chilled tea. Same with coffee, lemonade, etc. Excellent condition, with no chips or cracks. Interior is a bit dusty and part of the original cork is still in the bottom of the bottle. Please feel free to contact me if you have any questions. Thank you! This entry was posted in http://feedproxy.google.com/~r/JujubefunnyFinds/~3/vlqAfI5bMd8/vintage-italian-chianti-hand-blown-glass and tagged IFTTT. Bookmark the permalink.